Nanicula, Inc. is an example of a successful graduate from the I-Corps@Ohio 2018 cohort. 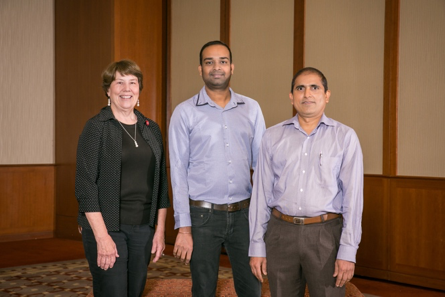 With a team and patent-pending technology from The Ohio State University (OSU), they participated in I-Corps@Ohio to test the commercial value of a new vaccine platform and delivery system for use in food animals. The initial focus is on decreasing human food borne illness by preventing Salmonella bacterial infection of poultry. Through the I-Corps@Ohio process, Nanicula validated that its innovation of a vaccine delivered to poultry through drinking water was a better way to prevent Salmonella contamination of eggs. They also discovered in their customer interviews that there was an unmet need for a process to treat poultry raised for meat that the technology would address, opening the opportunity for an even larger market than eggs. “The I-Corps process for me was invaluable, because our team had an opportunity to learn the field situation directly from the people who have been seeing the problem of Salmonella in poultry for decades. Such as how the current vaccines are performing, USDA and FDA regulatory issues, control strategies in place, and type of Salmonella vaccine they are hoping to have soon from researchers. All these inputs under the able guidance of I-Corps mentors have immensely helped and inspired us to take up the vaccine development research at OSU campus to fit the market demands,” said Dr. Aradhya Gourapura, Professor, Food Animal Health Program, Ohio Agricultural Research and Development Center, College of Food, Agricultural, and Environmental Sciences (CFAES) and founder of Nanicula.